Why do I get different flag options for different questions? In either case, I won't get all the options in the help page. Why is it different from question to question? And why can't I see all the options in the dialog? The issue is that Your first question is closed while the second question is open. Since the first question is closed there is no reason to give you the duplicate close or should be closed reasons as the question is already closed. You cannot close a closed question. The missing options refer to a state in which the question should be closed. Since the question you refer to is closed as a duplicate, flagging it for closure is useless since the system already considers it closed. 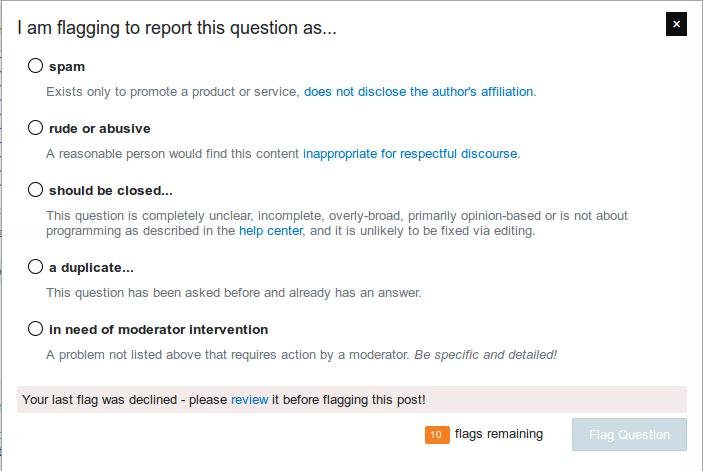 Requirements for flag to close option to appear? Flag declined, now I don't have flag options? Flag Answer doesn't show all options? Why does the “low quality post” flag for questions sometimes not appear?